Make this setting:Â my Phone’s visibility -> Shown to all on the cell phone. 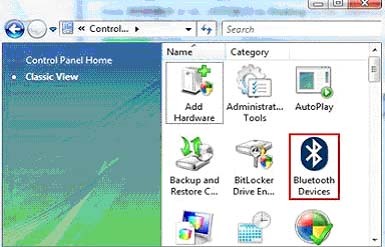 Check the box for “My devices is set up and ready to be found” in the Add Bluetooth Device Wizard dialog box. Select “Let me choose my own key” or “Choose a passkey for me” and click on Next. In the end you can launch the items of the cell phone.Â Transfer photos, videos etc to cell phone via Bluetooth technology.